German-born Nigerian defender Jordan Torunarigha has been recognized for his outstanding performance for Hertha BSC in their in their hard-fought 1-0 win over Nürnberg in the opening weekend of the Bundesliga. 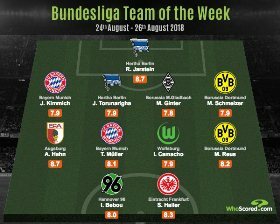 Football Statistics guru Whoscored has picked its Team of the Week, with Torunarigha named amongst the four defenders in a 4-4-2 formation. The 21-year-old was contacted by Super Eagles manager Gernot Rohr to beef up his team ahead of the 2018 World Cup, only for him to reject the overtures of the German despite the lure of playing in the biggest stage. In May 2018, he trained with Germany's senior squad containing the likes of Arsenal's Mesut Ozil and Bayern Munich's Jérôme Boateng ahead of their trip to Russia for the World Cup. Torunarigha won a game-high eight aerial battles against Nürnberg, had a team-high four interceptions and only Karim Rekik and Georg Margreitter made more clearances than him, with four each. The number 25 made one key pass, finished with a passing accuracy of 82 and was not dispossessed on the ball over the course of ninety minutes. Last season, Torunarigha made 12 appearances in the Bundesliga, seven of them starts.